It's always hard to start a new painting, and my FaceBook friends saw a few status updates from me this week about how hard it is to set up a still life. But I'm always relieved and excited when a still life finally comes together, even though it is rarely the vision I had when I started moving objects around on the shelf. I still have a lot of antique scraps of paper from an era when I did a lot of collage, and a little piece of envelope, slightly yellowed, with a foreign stamp and a "por avion" printed on it seemed a perfect fit with the uniquely proportioned glass bottle. 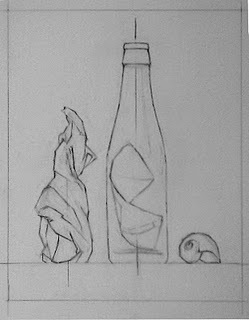 Another glass bottle wrapped in cream-colored tissue paper (not wax paper this time!) and a buttery-transparent little shell made friends, creating a harmony of creams. In my last still life "The Wave" I really liked how the blue-white of the wax paper highlights made the shelf edge look slightly yellow in contrast. In this arrangement the cream colored papers and seashell make the shelf seem more white. I think all my paintings are simply studies of all the different subtle hue variations within whites and grays.